While cannabis remains a controversial illegal drug, new research suggests it may have important medical uses. In a recent study, scientists found that it may help people who suffer from inflammatory bowel disease. It's a sensitive subject given the illegal nature of cannabis, but it may have brought us a step closer to understanding inflammatory bowel disease and finding ways to effectively prevent and treat the condition. Researchers had long heard anecdotal reports that cannabis smokers who had inflammatory bowel disease would smoke a 'joint' to ease their symptoms. They decided to investigate this potential link further within a clinical study. 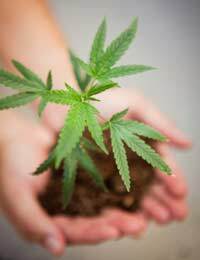 Their hope was that there might be some merit to the claims that smoking cannabis eased the pain and frequency of flare-ups for Crohn's disease and ulcerative colitis. Together, these conditions are known as inflammatory bowel disease (IBD). IBD is typically triggered by a hyperactive immune system. When this occurs, the gastrointestinal tract will become significantly inflamed, leading to pain and diarrhoea, exhaustion and eventually weight loss as well. It's a difficult condition to treat and each person can be unique in how they respond to modern treatments. When attacks occur regularly, the colon can become scarred and surgery may ultimately be required. As such, finding effective treatments is vital to easing the pain and improving the prognosis for sufferers. The research team found that the cells lining the gut had special cannabinoid receptors. These receptors are responsive to molecules found in cannabis. It would appear that these cells play a role in gut repair when it becomes damaged. To fully investigate a potential link, researchers purposefully caused damage to cells in the gut, thereby creating an inflammatory response. Then, researchers added in cannabinoids that were synthetic. The result was that the gut began to repair itself. Yet, it gets even more interesting because the researchers think that when a person has a healthy digestive system, there are natural cannabinoids that are released from endothelial cells if they are harmed or injured in some way. These cells then bind to the receptors, prompting a self-healing sort of response. These particular receptors seem to have a special role when it comes to easing the hyperactive immune system of IBD sufferers. It appears that they help to get rid of injured cells and reduce inflammation. Researchers hope we can find a way to trigger the body's natural cannabinoid mechanism rather than actually encourage cannabis use. In fact, other smoked compounds such as cigarettes tend to make IBD much worse. IBD is painful and distressing for the many people who deal with its effects on a regular basis. Without proper treatment, it can cause permanent changes to the gut and leave sufferers overwhelmed with the condition. New research is more important than ever to find ways to prevent damage to the gut from IBD. Hopefully, this recent study will bring us closer to understanding IBD as well as finding ways to prevent and treat the condition.